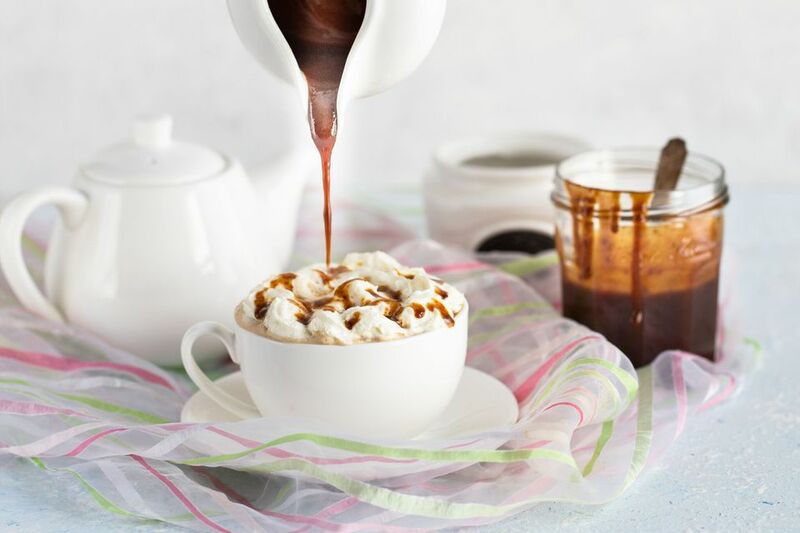 This easy recipe for homemade caramel sauce uses milk and butter rather than the heavy cream called for in most homemade caramel sauce. Cream produces a rich texture and keeps the mixture soft, but it isn’t an ingredient everyone has on hand at all times. Some recipes have gotten around this by using evaporated milk or sweetened condensed milk—two more ingredients the typical home cook doesn't stock. If you want to make delicious caramel sauce without running to the store, try this milk-and-butter technique—after all, what is cream but milk with more butterfat! Place the saucepan over medium-high heat and place a lid over the saucepan. Once the water has come to a rolling boil, remove the lid. Do not stir the caramel after this point otherwise you run the risk of your caramel becoming grainy by incorporating sugar crystals from the sides of the pot into the mixture. Cook the caramel until it is a golden brown color. If your caramel is cooking unevenly, you can gently swirl the pot to even out the sauce. Remove the pan from the heat and whisk in the butter. Once it has melted and become completely incorporated, gradually add in the milk and stir to combine. Be careful, because the milk could boil up quickly when it hits the hot caramel and changing the temperature too quickly could cause the caramel to separate. Return your caramel sauce to medium heat. Add the salt and stir the mixture until it is well combined. Boil for 1 minute until the sauce thickens slightly. Allow your caramel to cool and serve over your favorite frozen desserts or cakes. Make a double or triple batch and freeze to have on hand when the mood for caramel sauce strikes you. By covering the sugar and water with a tight-fitting lid, condensation will build up and run down the sides of the pot, cleaning off any sugar that may have collected there. You also can use a wet pastry brush to wash the sides of the pot. If you skip this step, crystals may form on the edges of your caramel, causing the sauce to become grainy. Before the caramel starts to darken, the bubbles will slow down and the mixture will look thicker. This is when you should start keeping an eye on it. Caramel goes from light to dark very quickly and burned sugar isn’t a good sauce. Once you can smell the sugar cooking, don’t walk away from the kitchen. At this point, cover the pot one more time for 1 to 2 minutes to ensure there won’t be any crystals. Adding a pinch of salt to your caramel will actually make it sweeter because the salt counteracts the bitter notes of a deeply caramelized sugar. However, you can always add more to make this a true salted caramel. Add 1/8 of a teaspoon for a gentle flavor, or 1/4 teaspoon for a bold salted caramel sauce flavor. If you use unsalted butter, you can increase the salt to 1/2 teaspoon.